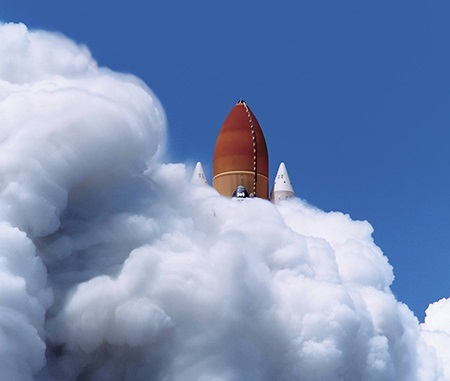 A space shuttle, the ultimate symbol of human excellence, opens this collection of images by Mikiya Takimoto, a Japanese photographer whose work is presented here for the first time in Europe. The Atlantis rocket, photographed with astonishing pictorialism, reveals itself with futility (absurdity even?) and questions the very reason behind its existence. Its portrait symbolises the momentum of global chaos. Mikiya Takimoto then takes us and loses us at the ends of the Earth, photographing the sea from a bird’s eye view, climbing to the top of a volcano veiled in toxic fumes, or drowning his gaze in the immensity of a crumbling polar cap. He analyses the mechanisms and the movements of our planet, documenting the incredible beauty escaping from its chaos. A force that’s hard to grasp emanates from his images. What are we looking at? Is it animal, it is plant? Emptied of all nature, of all gravity, could it be the exact opposite? Mikiya Takimoto’s scenes question the position that man persists in maintaining on the margins of the reality of the world.